We’re often asked, “Nachi Cocom vs Mr Sanchos… which is the best Cozumel day pass? Don’t worry, we won’t give you the typical and annoying answer, “it depends.” We have a clear cut winner here. After analyzing a bunch of factors, the Nachi Cocom vs Mr Sanchos contest is finally settled. Before we get into the contest rules and ultimately ding the bell, there’s something to be said. While these are two of the most popular options, you have seven other great choices for your day at port. For details, see our full list of 9 All Inclusive Day Pass Options in Cozumel. There’s a resort option for everyone, whether an intense snorkeler, partier, or lounger. If you’ve checked out the other options and are settled on Nachi Cocom vs Mr Sanchos, then we’re here to help. 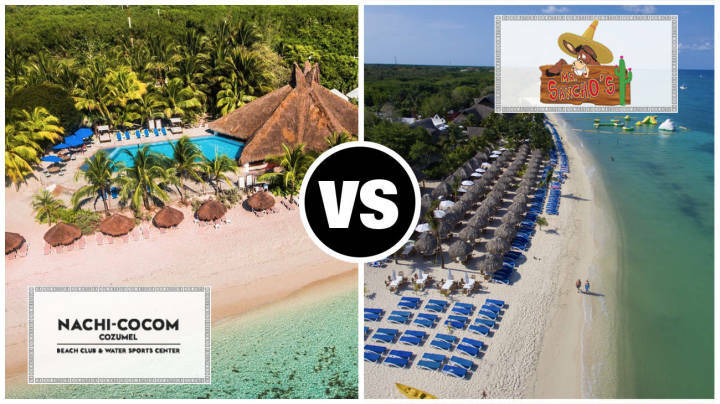 Below you’ll find an infographic showing the two resorts along with a number of different characteristics we’ve found are most important to visitors. The green ribbon indicates the winner for that particular resort feature. From the analysis above you can see that Mr Sanchos is the clear winner. The resort is cheaper, includes more, and has more flexibility. This isn’t to say Nachi Cocom is a bad choice. It’s a spectacular resort. Arguably, the second best on the island. If the following items are important to you, however, Mr Sanchos beats out Nachi Cocom in the battle of the all inclusive resorts. We’ll go through each of the factors noted in our infographic, to provide a bit more color and to help understand how each round was scored. Both resorts limit the amount of daily passes sold. It’s highly recommended that you reserve your spot as soon as possible if interested. Nachi Cocom allows only 150 people per day to their resort. Mr Sanchos has 3x the capacity, allowing 450 guests per day. Please note that these are two of the most popular cruise excursions in Cozumel. They often sell out. Both resorts are all inclusive. This “includes” all of the most important items you’d need for a great beach day. Namely, food, drinks (including alcohol), beach, and beach amenities. You’ll have comfortable chairs, umbrellas, hammocks and more to get some sun or lounge in the shade. Mr Sanchos charges $49.95 per adult for an all inclusive day pass. Nachi Cocom entrance fee is 10% higher at $55 per adult. You can take that extra $5 and buy a luchador mask on your way back to the ship. While Nachi Cocom is more expensive for adults, their child price is nearly half the cost at $19 vs $35 for Mr Sanchos. Both resorts consider a “child” as aged from 4 to 11 years old (younger than 4 is free). Below we’ve done a quick cost analysis for a family with children. This is an easy round going to Nachi Cocom. The resort opens at 8:00 AM and closes at 5:00 PM. This is an hour more than its rival, which doesn’t open until 9:00 AM. Typically, cruise ships arrive to port very early. For the early risers out there, this extra hour can come in handy. There are no winners here. The two parks are relatively equidistant from all three Cozumel cruise ports and will cost the same via taxi. You can use our Cozumel Cruise Port Taxi Rates post for exact costs to all nearby attractions and also for our secret to saving money on taxis in Cozumel! Hopefully, “wifi” won’t be too much of a factor in your decision between Nachi Cocom vs Mr Sanchos. But, we get it. You need to check you fantasy football stats, facetime the kids, and check that bank account balance after previous night at the cruise ship casino. Nachi Cocom offers a small area with free wifi, while its competitor has no ability to connect to the outside world. Depending on your mindset, kiddie attractions could be a “plus” or a “minus” in your Nachi Cocom vs Mr Sanchos decision. If you have the little ones with you, it’s a huge bonus. The kids can entertain themselves while you hit the bar. If you don’t have kids (in life or just on ship), you might not want to see any of the little angels nearby. Neither resort offers child-specific options like playgrounds or the like. Both have aqua parks for a cost. If a kiddie-area is a “must have” amenity, you can check out other options in our full list of Cozumel Resort Day Passes. Mr Sanchos offers an Aqua Park with a bunch of features. Included are the following: Climbing Icebergs & Rocks; four Water Trampolines; Pyramid Slide; Water Totters; Moonwalk with Bouncers; Rock Slider. Unfortunately, however, access to the water park isn’t included in your admission price. It’ll cost an extra $12 for all-day access to this area. Nachi Cocom does not offer a water park. If you’re like us, this is a mandatory item when picking your day pass. Fortunately, both properties offer beautiful swim-up bars. Just be weary of the guy who never leaves his underwater barstool. Surprisingly, neither resort offers snorkeling gear with your admission pass. At Mr Sanchos, you have the option to rent equipment for the day. It will cost you $20. Nachi Cocom has a guided snorkeling excursion for $38. This seems a bit crazy, since you can purchase one of those brilliant new full-face snorkels for less than that on Amazon. Mr Sanchos offers kayaking, sailing and windsurfing. Nachi offers nothing in terms of water sports. Mr Sanchos slightly wins in terms of additional “free” extras. You’ll have access to lockers free of charge. Also available are tiki huts, hammocks, jacuzzi, and beach volleyball court. Nachi Cocom doesn’t offer any similar, free amenities. But, it does have a few add-ons for a cost. As mentioned, snorkeling can be purchased for $38. Beach massages and photo packages are also available at a price. Towels are not included with your Nachi Cocom visit. You’ll need to bring your own from the cruise ship. Just don’t lose it, or it’ll cost you. At Mr Sanchos, you can rent towels for $5 (after your $10 refundable deposit). Easy winner here. Mr Sanchos offers a full refund with a cancellation made with more than 11 days advanced notice. The competition does not offer a refund. Based on the factors above, we had to pick Mr Sanchos as our winner. Some people will disagree and we totally understand. Both offer an amazing way to spend your day in Cozumel. Regardless which you choose, you’ll want to book before these sell out. Click below to see if passes are still available for your day in Cozumel.